Let’s keep it real: many pre-workout supplements are a dud when it comes to producing muscle pumps. Nothing is more frustrating. Well, we’re confident GAT NITRAFLEX PUMP should help you get those veins popping during the toughest workouts, as you’ll find out in this review. Unique formulation. Rare ingredient combination which helps increase your muscle pumps and more . Shorter recovery time. Special pre-workout which helps boost bone and joint health. Stimulant-free. You won’t experience and spike-crash effects and jitters from this pre-workout. RECOMMENDED DOSAGE: Mix 1 serving (2 scoops) of NITRAFLEX® PUMP with 10-12 oz. of cold water and consume within 30 minutes before working out. Can take up to two servings daily. If you’re a bodybuilding enthusiast, nothing compares to the muscle pump – the time when you engorge your muscles with blood during a hard workout. Your muscles swell to the point you achieve that “pumped up” sensation while you train. There’s nothing quite like it. Fitness experts say adequate hydration, superset training, proper muscle contraction, shorter rest periods, and drop sets are some of the ways you can maximize your muscle pumps. However, supplementing with key pre-workouts should also help increase vasodilation and blood flow. More specifically, our Best Pre-Workout Supplements for Vascularity come to mind. As the article’s title implies, these featured bodybuilding products should help you achieve the best muscle pumps of your life. Take ALTIUS, for example – it has a whopping eight grams of l-citrulline malate 2:1 (a combination of l-citrulline and malic acid) per serving. If that much doesn’t give you skin-splitting muscle pumps, we don’t know what will. On that note, let’s see if GAT NITRAFLEX PUMP is up to the daunting task. The manufacturer describes this supplement as its “Hyperemia & Strength Formula” which can “create dramatically-extended muscle pumps while weight training,” per the manufacturer’s official website. GAT NITRAFLEX PUMP should help increase your muscle pumps, and then some. If you’ve never heard of the word “hyperemia” before, it simply means excess blood flow to the body’s different tissues. Few – if any – bodybuilding supplement manufacturers use this to describe their pre-workouts. We think GAT Sport did a splendid job of getting customers’ attention. However, the bigger question looms: can GAT NITRAFLEX PUMP blow the competition away? It should be interesting to find out. GAT NITRAFLEX PUMP has four grams of l-citrulline per 14.2-gram serving. This is a non-essential amino acid and natural watermelon ingredient. It’s also a precursor to l-arginine. Long story short, l-citrulline is a powerful vasodilator – it helps increase blood flow and muscle pumps. It also assists in nutrient uptake and regulates blood pressure levels. What’s more is l-citrulline helps detoxify ammonia (a colorless gas and waste product). This bodes well for exercise recovery. “Our findings suggest that citrulline supplementation may be useful for improving the exercise performance of athletes,” per a study the Journal of Nutritional Science and Vitaminology published in 2011 (via NCBI.NLM.MIH.gov). No wonder l-citrulline is a bona fide pre-workout Jack of all trades. If you want to bring your workouts to the next level, four grams of l-citrulline per serving should help. It may not be as much as say, Optimum Nurition PRO PRE (which has six grams of l-citrulline per 18-gram scoop), but it should do the trick. “With respect to the NO (nitric oxide) cycle, administration of l-citrulline may thus play a role in NO metabolism and regulation by being an Arg (l-arginine) precursor for NO synthesis,” per the International Journal of Food and Nutritional Science (via OmmegaOnline.org). GAT NITRAFLEX PUMP’s second-biggest component is two grams of HydroMax® Glycerol. This is an odorless liquid which some experts consider a sugar alcohol. It’s a common ingredient in many protein bars today. HydroMax® Glycerol Powder 65% also contains 35 percent silica (or silicon dioxide), a compound which helps boost the absorption of vitamins and minerals for optimal bodily function. With that in mind, GAT NITRAFLEX PUMP can help boost the potency of a big-name multivitamin such as NOW ADAM. Try stacking them up, and you’ll reap tremendous health and fitness benefits. GAT NITRAFLEX PUMP also has two grams of taurine per serving. This versatile amino acid has the potential to ward off free radicals and inflammation. The key takeaway: taurine can shorten recovery time and keep oxidative stress at bay. It allows you to work out more efficiently at the gym. The bottom line: taurine isn’t just great for your workouts, it’s also beneficial for your long-term health. We’re glad it’s in GAT NITRAFLEX PUMP. GAT NITRAFLEX PUMP has one gram of CarnoSyn® Beta-Alanine per two-scoop serving – a certified pre-workout superstar (we say it’s in the same stratosphere as l-citrulline). Beta-alanine is a naturally-occurring beta amino acid which helps buffer muscle carnosine levels. The result: the ability stave off fatigue and increase exercise work capacity. In other words, beta-alanine allows you to work out longer and harder. That’s good and all, but you have to bear in mind the participants of the study supplemented with a whopping 6.4 grams of beta-alanine for five weeks. No pre-workout on the market has that much (LEGION PULSE’s 4.8 grams of beta-alanine per serving is one of the most we’ve seen among pre-workouts). Nonetheless, GAT NITRAFLEX PUMP’s one gram per two-scoop serving should help. Here’s good news for muscle pump enthusiasts: beta-alanine’s ability to buffer muscle carnosine levels allows it to ramp up nitric oxide in your body. Pair it up with four grams of l-citrulline, you should see your veins bulge out during your toughest workouts. Another key component we highlighted in the Best Pre-Workouts for Vascularity article we previously mentioned is agmatine sulfate. 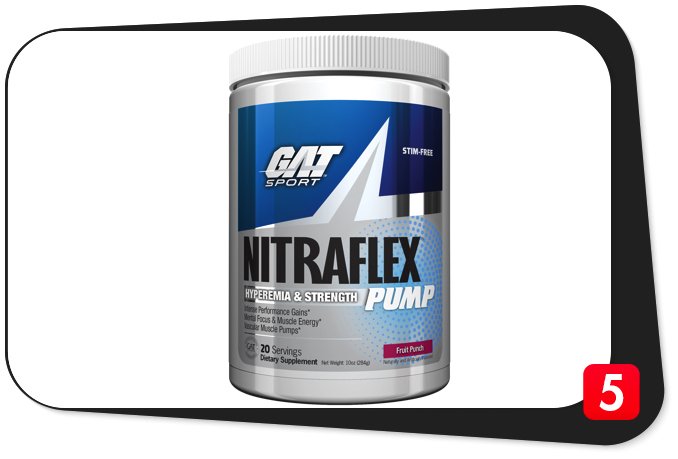 GAT NITRAFLEX PUMP gives you 500 milligrams per 14.2-gram serving. Simply put, agmatine sulfate is a natural metabolite of the nitric-oxide-boosting amino acid l-arginine. Aside from its nitric-oxide-boosting prowess, agmatine sulfate also helps keep mental stress at bay and ward off depression. You’ll find this component in many pre-workout formulations (including Redcon1 Total War). Our take: it’s a great complement to bigger vasodilating ingredients such as l-citrulline and beta-alanine. GAT NITRAFLEX PUMP’s sixth key component is 200 milligrams of masson pine bark extract per tw0-scoop serving – one of the more uncommon pre-workout supplement ingredients. One of masson pine bark extract’s most impressive benefits is its ability to regenerate vitamin C, a powerful antioxidant (no wonder you can find it in many multivitamins and vision supplements). You can credit this trait for masson pine bark extract’s cardiovascular-boosting prowess: vitamin C also helps shore up blood pressure levels and heart health. This ingredient also helps ward off cataracts and free radicals, keep varicose vein swelling at bay, improve memory and fertility, and slow down the aging process. Masson pine bark extract doesn’t enjoy the sterling reputation of l-citrulline as a pre-workout ingredient. However, we’re confident this versatile component will make waves in the bodybuilding supplement industry for years to come. GAT NITRAFLEX PUMP also has 150 milligrams of calcium fructoborate per 14.2-gram serving. This organic compound combines fructose, boron, and calcium. It’s also a natural ester in many fruits and vegetables. It turns out calcium fructoborate is great for your bones, joints, and heart. “Nutritional supplementation with CF (calcium fructoborate) offers significant benefits in support of healthy bones and joints, as well as for cardiovascular health,” per the December 21, 2015 issue of Biological Trace Element Research (via NCBI.NLM.NIH.gov). The secret to calcium fructoborate’s benefits for joints and bones lies in its anti-inflammatory properties. On this note, when you complement your workouts with GAT NITRAFLEX PUMP, you can say goodbye to that sore feeling after your workouts. That’s music to any bodybuilder’s ears. Plus, the manufacturer highlights this ingredient’s ability to ramp up testosterone levels. “A long-term CFB study reported a free testosterone increase of up to 29 percent.” More testosterone translates to increased muscle mass and strength. GAT NITRAFLEX PUMP should help you establish new personal bests at the gym. Our take: just like masson pine bark extract, calcium fructoborate is an unheralded pre-workout supplement ingredient. We’re confident both will make a resounding impact in pre-workout formulas from here on out. The reason: l-norvaline (which you can find in other pre-workout supplements such as Universal Nutrition Animal Pump) inhibits the production of the enzyme arginase, which limits nitric oxide production. Long story short, with l-norvaline around, your nitric oxide ceiling knows no limits. Throw in the likes of l-citrulline, hydromax glyercol, and agmatine sulfate into the mix, you get one potent nitric-oxide-boosting formula. L-citrulline, 4 g: L-citrulline is a non-essential amino acid and l-arginine precursor which helps increase vasodilation, muscle pumps, and blood flow. It also helps facilitate nutritional uptake and regulates blood pressure levels. This ingredient is arguably the most powerful vasodilator on the market today. Four grams per serving isn’t the most in a pre-workout, but it should do the job nicely in conjunction with other nitric oxide boosters. HydroMax® Glyercol Powder 65%, 2 g: This is an odorless liquid which helps increase hydration and exercise endurance. It also contains 35 percent silicon dioxide, which helps improve vitamin and mineral absorption. That certainly bodes well for long-term health. Taurine, 2 g: A versatile amino acid which helps ward off oxidative stress, shorten exercise recovery time, boost fat loss, improve sleep quality and insulin sensitivity, increase testosterone levels, and regulate cardiovascular and neurological function. CarnoSyn® Beta-Alanine, 1 g: A naturally-occurring beta amino acid which helps buffer muscle carnosine levels for increased exercise work capacity and nitric oxide levels as well as resistance against fatigue. In other words, beta-alanine enables you to work out longer and harder – it’s a proven and tested pre-workout ingredient. Agmatine Sulfate, 500 mg: Agmatine sulfate is a natural metabolite of l-arginine, a nitric-oxide-boosting amino acid. This component also helps keep depression and mental fatigue at bay. Masson pine bark extract, 200 mg: A versatile herbal ingredient which helps improve blood pressure levels and heart health, ward off joint inflammation, cataracts, and free radicals; regulate immune system function, keep oxidative stress at bay, regenerate vitamin C levels, and boost memory. Calcium fructoborate, 150 mg: An organic compound and natural ester in many fruits and vegetables which helps boost bone, joint, and heart health. 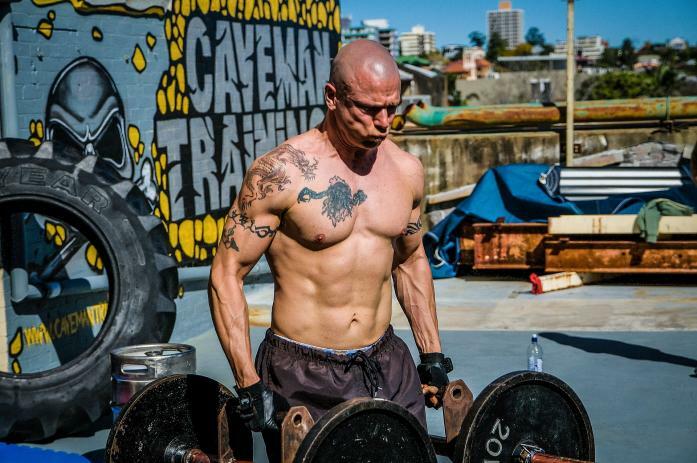 Plus, calcium fructoborate helps increase testosterone levels and keep inflammation at bay. L-norvaline, 150 mg: An amino acid which helps inhibit arginase activity for increased nitric oxide levels. GAT NITRAFLEX PUMP’s l-citrulline, agmatine sulfate, and hydromax glycerol components complement l-norvaline perfectly. Train like a beast with GAT NITRAFLEX PUMP. 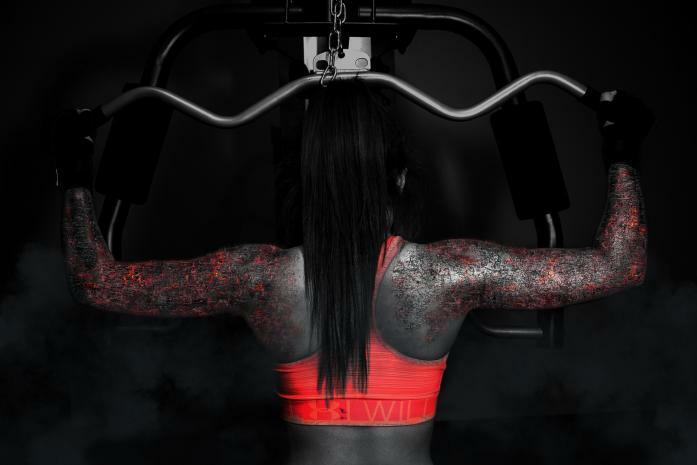 The manufacturer dubbed GAT NITRAFLEX PUMP its signature “Hyperemia & Strength Formula.” After a thorough analysis, we say this nitric-boosting formula’s versatility should give you a fast return on your fitness investment. It isn’t perfect, but it should help you achieve your fitness goals and conquer your workouts at the gym. Here’s what sets GAT NITRAFLEX PUMP apart from the rest of the field: its uncommon formulation. We dare you to look for a similar one among vasodilators and pre-workouts. We’re sure you’ll come up empty. Where can you find such a product which harnesses the powers of l-citrulline, HydroMax® Glycerol Powder 65%, taurine, CarnoSyn® Beta-Alanine, agmatine sulfate, masson pine bark extract, calcium fructobarate, and l-norvaline? We’re telling you, the manufacturer put together a well-thought-out vasodilating bodybuilding product. You can’t go wrong with four grams of l-citrulline per 14.2-gram serving. We’re talking about arguably the most efficient and powerful vasodilator on the market. Like we said, it’s not enough to trump the likes of the aforementioned Optimum Nutrition PRO PRE (which boasts of six grams of l-citrulline per scoop). Nonetheless, GAT NITRAFLEX PUMP’s four grams per serving isn’t bad at all. Better yet, expect its other components to pick up the slack. We also like the inclusion of another certified pre-workout superstar in CarnoSyn® Beta-Alanine (one gram per serving). If you habitually feel sluggish during your workouts, this ingredient should help rev up your engine. Like we said, beta-alanine increases exercise work capacity, builds resistance against fatigue, and ramps up nitric oxide levels – three benefits hard exercisers need. For its part, agmatine sulfate (GAT NITRAFLEX PUMP has 500 milligrams per two-scoop serving) is a relatively common pre-workout component. This natural metabolite of l-arginine should help increase nitric oxide levels and ward off mental fatigue. It complements GAT NITRAFLEX PUMP’s l-citrulline and CarnoSyn® Beta-Alanine components nicely. Some experts have doubted taurine as a pre-workout supplement ingredient (mainly because it may have inhibitory properties). Nonetheless, two grams per serving should give you good fitness benefits: shorter recovery time, increased fat loss and testosterone levels, improved heart and brain function, and improved insulin sensitivity and sleep quality. Taurine is indeed a Jack of all trades. As for l-norvaline, we like its ability to destroy the nitric oxide ceiling. If you want to achieve peak nitric oxide levels, this amino acid should help you do just that. We said it before and we’ll say it again: if you want your nitric oxide levels to go through the roof, try a pre-workout with l-norvaline. We’re stoked GAT NITRAFLEX PUMP (150 milligrams per serving) has it. GAT NITRAFLEX PUMP’s three other components – HydroMax® Glycerol Powder 65% (two grams per serving), masson pine bark extract (200 milligrams per serving), and calcium fructoborate (150 milligrams per serving) – give it its unique identity. Get ready for improved vitamin and mineral bioavailability, better heart health, shorter recovery time, and increased resistance against joint and bone issues. It just doesn’t get any better than that. It bears repeating: GAT NITRAFLEX PUMP’s formulation is one-of-a-kind, to say the least. The best part: it should keep you on your toes without the side effects of caffeine and other stimulants during your training sessions. The manufacturer also does a tremendous job in terms of transparency – it breaks down all of the ingredient amounts. You won’t find any shady proprietary blends in GAT NITRAFLEX PUMP. We love it. The main knock against this product is its filler content – its Fruit Punch flavor has sucralose and FD&C Red No. 40. These are two artificial ingredients you’re better off skipping. It would’ve been better had the manufacturer resorted to natural alternatives such as stevia and beetroot powder instead. Despite this flaw, GAT NITRAFLEX PUMP exceeded our expectations. We’re sure they’ll exceed yours, too. It may be a new pre-workout supplement, but it should gain serious traction among customers sooner than later. In fact, you shouldn’t act surprised if it makes it to our Best Pre-Workout Supplements list one day. GAT NITRAFLEX PUMP helps “create dramatically-extended muscle pumps while weight training. Impressive, bigger, and longer-lasting NITRAFLEX pumps! It’s stim-free, and won’t keep you awake after night training. Even those sensitive to stimulants can take it,” per the manufacturer’s official website. The manufacturer intended GAT NITRAFLEX PUMP for healthy and active individuals who are at least 18 years of age who want to increase vasodilation, muscle pumps, blood flow, resistance, and energy levels; boost fat loss, improve long-term health, and achieve their daily fitness goals. GAT NITRAFLEX PUMP contains sucralose (an artificial sweetener) and FD&C Red No. 40 (an artificial food coloring) – two synthetic ingredients with certain side effects. If these, or any other ingredient, make you feel doubtful, please consult your physician before buying GAT NITRAFLEX PUMP. Impressive formulation. You won’t find a combination as unique as this one on the bodybuilding supplement market. Increased vasodilation. Look no further than this product’s l-citrulline, glycerol powder, beta-alanine, and agmatine sulfate components. Four grams of l-citrulline per serving. Arguably the best vasodilating ingredient among pre-workout supplements. One gram of beta-alanine per serving. Get ready to work out longer and harder. L-norvaline. One hundred fifty milligrams should suffice in destroying that nitric oxide ceiling. Masson pine bark extract and calcium fructoborate. Rare pre-workout ingredients which help shorten recovery time. Flavor options. Comes in tasty Fruit Punch and Watermelon flavors. Fillers. Contains sucralose and FD&C Red No. 40. Let’s keep it real: many pre-workouts fizzle out when it comes to producing the desired muscle pumps. Not GAT NITRAFLEX PUMP – its unique formulation should help you achieve those skin-splitting muscle pumps in conjunction with hard training and sound nutrition. Not only that, but it’s also one of those pre-workouts which help shorten your recovery time. That’s saying something. This New Kid on the Block impresses on almost all fronts. We’re confident it will help you take your workouts to the next level. If the manufacturer can smooth out the rough edges (particularly the filler content), much better. We recommend you buy GAT NITRAFLEX PUMP. Go ahead and reap the many benefits of this Hyperemia & Strength Formula today.